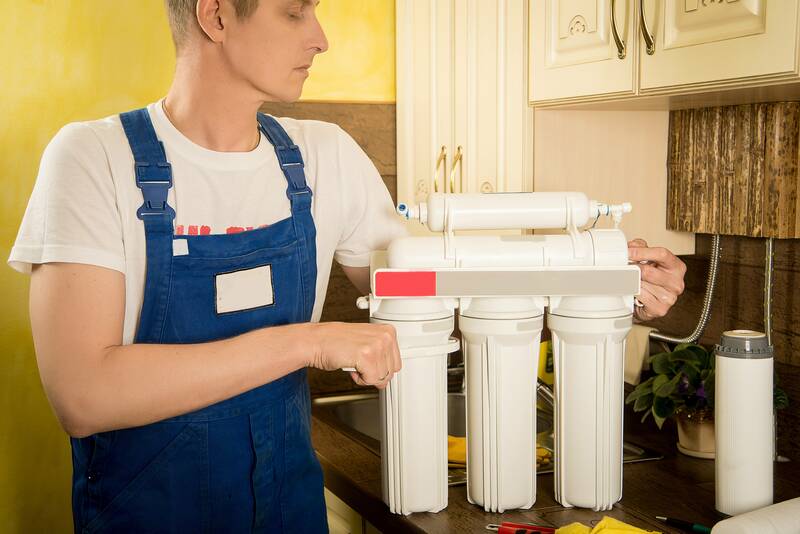 After you have installed your Reverse Osmosis system at your home, you will easily get gallons of pure water similar to the bottled one you used to buy at the stores. The relief that comes with this is great; no more time spent going to buy drinking water while there is quite a lot of it running from the taps. And to top it up, no more money spent on the water. For you to maintain this you will need to keep the Reverse Osmosis system in its best conditions. This is why you need to know how and when to clean it up. Based on how much you use your RO system, the cleaning time may vary. You can use your judgement to decide on the interval but it should fall between 3 and 12 months. Another sign that shows you need to need to do some sanitization is when the water flowing from the system starts having a funny taste or the filters and the membrane are worn out. Before you get to the cleaning process, here are some of the tools that should be by your side: First of all, only use soft water to clean the system and also for dilution of the chemicals used. A cleaning tank is needed as well as a RO cleaning pump. We should not forget having an appropriate tank cooler and a tank mixer. Make sure you empty the storage tank completely and water supply to the RO system is also cut out during the cleaning process. After emptying the tank, leave the system for a few minutes then remove the filter housings. Remove the filters and the RO membrane then replace the housings. Run clean water through the system. Secondly, dilute the chemicals recommended for cleaning the RO by the manufacturer, for example bleach. Run the solution through the system for an hour then follow this with two rounds of clean water to remove the chemical residues. Disassemble the system again. Clean the housings with soap solution and rinse with soapy water. At this stage, you can check the state of the O-rings and decide if they need replacement. Damaged rings definitely need replacement but if they are only dried up then lubrication with water-based lubricants is good enough. Because it is largely the state of the filters that suggest whether the RO needs cleaning, it is good to replace them during this time. The sediment filter is installed first then its housing mounted back. The substitute carbon filter is then placed in the middle housing and reinstalled. After all the parts are back to their positions, open the valve to let water flow into the RO system. Open the RO faucet and wait for water to start dropping out. When the water starts trickling out, close the faucet and let the storage tank fill. Empty the tank and fill again twice. After this, you RO is ready for use again. Thanks for the tips. Those reverse osmosis water filters can be tricky. This made cleaning one a breeze. Appreciate it. The water quit running out of my RO system. I checked air pressure and set it at 7psi. Took all the filters out and hooked the water back up and still no water would go into the tank or out of the faucet. Say what? Thanks a lot for sharing these tips. Cleansing of the water filters can prove to be a task at times. I would really try this out next time and would love to share the feedback with you. Keep sharing such handy tips and tricks! Well! I strongly agree with you at the point of cleaning RO system Occasionally. But I am confused at the moment, should I clean it at the time of filter replacement or periodically after every 3 Months. Is the cleaning process of RO system prolonged filter lifespan? I am planning on cleaning mine. I don’t have enough money to let it clean by a professional so I am doing it my self just to save. I have changed all filters and membrane and made sure the water supply was adequate yet no water coming out the connection leading to the thank.